Deendayal Upadhyaya E-Rikshaws Scheme: The minister for Road transport, Highways and Shipping Shri Nitin Gadkari has said the Shri Narendra Modi’s Government is committed to removing poverty through employment generation and make India an empowered nation. Addressing a rally of electric rikshaw pullers in New Delhi today the minister announced some important policy decisions including removing the rickshaws which run with power below .65 watts from the preview of the Motor Vehicles Act. He said the drivers of these rickshaws should be their owners and they should be able to register their vehicles with the Municipal corporation with a fee of Rs.100/- and get an Identity Card. Shri Gadkari said that he has proposed to the Prime Minister and the Finance Minister that the scheme may be called “Deendayal e-Riksha”. Loans for these vehicles may be given at an interest rate of 3% per annum. The minister said the objective of the scheme was to remove the practice of man pulling a man and luggage through manual rikshaw. 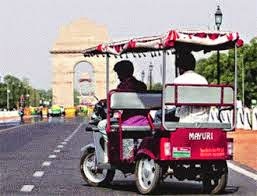 The minister said that four people may be allowed to travel in these rikshaws along with two pieces of luggage of 25 kgs each. Shri Nitin Gadkari said amidst uproar of rikshaw pullers and others who attended the rally that this first decision of the ministry after his takeover is aimed at benefitting two crore rikshaw pullers of the country. He said the poor in the country cannot be distinguished on religious or caste ground. Shri Gadkari also advised all rikshaw pullers to buy only quality rikshaw for the safety of the people.